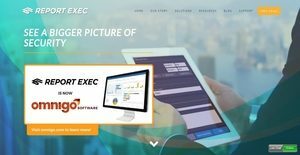 Report Exec is an incident reporting and security management system designed for various organizations, corporations, and industries. It is currently known as Omnigo Software. Comprehensive yet easy to use; the software offers some modules that are exclusively built for law enforcement professionals, security officers, and investigators. Report Exec streamlines their processes such as the issuance of citations to offenders, compilation of arrest and booking reports, and investigation of incidents and cases. Report Exec is also used by industries and corporations which include transportation, healthcare, hospitality, casinos, and campuses. The software helps them document incidents related to the safety of their employees and information on violence that occurs in their workplace. In addition, the software enables them to record how they respond to emergency situations, such as when there is a natural disaster or an injury. The other modules offered by Report Exec enable users to send mass notifications and alerts to groups of individuals, track the check-in/out of their visitors, track the release and return of their equipment, property, and tools; manage lost and found items, and issue parking permits. Last but not the least, the software helps them assess their security operations and procedures through the aid of statistics and data-driven reports. One of the most interesting modules offered by Report Exec is its Investigations Module. This module eliminates the time-consuming process wherein investigators need to pick out details of cases from paper-based reports and establish connections among them. This is because the software allows investigators to automatically access reports and information from its database so they will be able to investigate on cases effectively and efficiently. Therefore, the software enables them to link related reports, contacts, vehicles, property, and even digital media. Furthermore, they will be able to set specific criteria so the software will automatically crosscheck descriptions and information in the database. They will also be able to receive alerts if an incident report provides a similar information that they can connect to the case they are currently investigating. Interestingly, the Investigations Module of the software is connected with its Case Reports Module. As a result, users will be able to launch their investigations directly from the Case Reports Module. They can assign tasks to other investigators from the module. Meanwhile, the Case Reports Module allows users to record all the information related to an incident. This includes the time and date the incident occurred, the individual, property or vehicle involved in the incident, and the contact information of the individual. They will also be able to include narrative information to their case reports. In addition, users can customize this module by configuring its drop-downs, shortcut codes, and auto-filling fields. Another Module offered by Report Exec is its Risk Management Module. This module is exclusively built in order for users to ensure that their employees are safe in their workplace. It helps them record the illnesses, injuries, and deaths of their employees. They will also be able to track how often their employees incur injuries from their workplace, as well as, what incidents are causing such injuries. Additionally, users can record the actions they have taken to prevent the occurrence of incidents that are causing employee injuries. As they are able to access all the information they need related to these incidents, they will be able to address the dangerous conditions existing in their work environment. Report Exec also provides users with the capability to keep a record of events occurring during their shift. Through the aid of its Daily Event Log Module, users will be able to track the activities their employees are participating in. They can also use this module to monitor the activities of their officers to ensure that they are responding to the incidents and emergency situations reported to them. To leverage all the data that users have in the database of the software, Report Exec offers a module that provides them with security statistics. With its Admin Reporting Module, users will be able to obtain insights and make better decisions to ensure that their workplace is secure and safe. In this module, the information available on incident reports can be used as search filters. As a result, users can easily access the specific information they need when they analyze security procedures and issues. They will also be able to set up the types of reports that the software will automatically generate and email to them. It's important to keep in mind that almost no software in the IT Management Software category will be a perfect solution that can match all the needs of different business types, sizes and industries. It may be a good idea to read a few Report Exec reviews first as specific software may excel exclusively in a really narrow set of applications or be prepared with a very specific industry in mind. Others might work with an intention of being easy and intuitive and consequently lack complicated functions needed by more experienced users. You can also find apps that focus on a broad group of customers and provide a powerful feature toolbox, but that usually comes at a more expensive price of such a service. Be certain that you're aware of your needs so that you choose a solution that has exactly the elements you search for. How Much Does Report Exec Cost? Report Exec’s enterprise pricing information is available only upon request. Contact the company for more details, and ask for your quote. We realize that when you make a decision to buy IT Security Software it’s important not only to see how experts evaluate it in their reviews, but also to find out if the real people and companies that buy it are actually satisfied with the product. That’s why we’ve created our behavior-based Customer Satisfaction Algorithm™ that gathers customer reviews, comments and Report Exec reviews across a wide range of social media sites. The data is then presented in an easy to digest form showing how many people had positive and negative experience with Report Exec. With that information at hand you should be equipped to make an informed buying decision that you won’t regret. What are Report Exec pricing details? What integrations are available for Report Exec? If you need more information about Report Exec or you simply have a question let us know what you need and we’ll forward your request directly to the vendor.